Kabul was rocked by four explosions Friday, killing dozens of people and wounding hundreds of others, according to Afghan officials. The attacks began Friday morning when a truck bomb exploded near a government complex and military base in a residential part of Kabul. So far, 15 people have been reported killed in that attack, Afghan officials said. Then, in the evening, four suicide bombers detonated a bomb outside the Kabul Police Academy, killing at least 25. The attackers reportedly aimed to break through the wall of the academy, according to The New York Times. A third bombing occurred Friday evening near the airport, and witnesses reported also hearing the sound of gunfire. This blast was shortly followed by the explosion near the counter-narcotics ministry, which is close to coalition bases and Afghan government building. 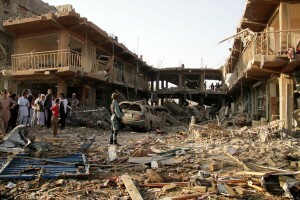 Gunfire was heard after the attack and witnesses have also reported hearing NATO jets flying overhead, Reuters reported. So far, there is little information on whether the attacks are related. The Taliban claimed responsibility for the second attack but has not spoken out about the others. Left: Afghan Police inspect the scene of a bomb blast in Kabul, Afghanistan, 07 August 2015. Photo by Haroon Sabawoon/Anadolu Agency/Getty Images.